He has to make a decision: earn a lot and not win or earn and become a champion. 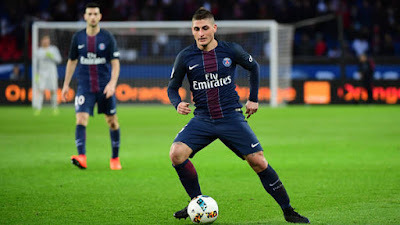 Marco Verratti's agent has given the biggest indication yet that the Italian midfielder is prepared to leave Paris Saint Germain for a big money move to a "top European club" this summer. Verratti has been linked with a big money move away from PSG for each of the last two or three seasons having made such an impact with the French champions. On each occasion, the player and his agent have come out and rejected reports of him even thinking of leaving the French capital as he wanted to be part of the plan for PSG to win the Champions League. The problem for PSG and for Verratti is that despite the huge financial outlay from their middle eastern owners, the club themselves are no closer to doing so with their exit this season at the hands of Barcelona a demonstration of the fact. Having taken such a lead to the Nou Camp, to be in the driving seat and being installed as clear favourites to progress to the next round ahead of the game, all they had to do was dig in, sit tight and compact and deny Barcelona any chance of scoring. As we know it failed miserably. According to this report in The Mirror, Verratti was left devastated by the defeat and has realised that although he earns a small fortune playing week in, week out he now realises that he is far from winning the Champions League. He is now thought to be considering a move in the summer. "The situation is very complicated – he has a very good contract until 2021. He wants to win and PSG, like it is, cannot win. He has been in Paris for five years now and he has to make a decision: earn a lot and not win or earn and become a champion. It is not a problem of money. Whoever signs Verratti will pay him a lot of money. One thing is certain: if he leaves PSG, it will be for a top European club. There are some top Italian clubs but I have my doubts Italy will be his final destination. Spain, the Premier League or the Bundesliga? A top European club." As you can imagine, Chelsea will be linked with a move for the combative Italian midfielder with Antonio Conte sure to be more than interested in the 24-year-old. The problem for Chelsea is that a certain Carlo Ancelotti manages Bayern Munich over in the Bundesliga who at this stage, have more chance of winning the Champions League than Chelsea if we are honest, with them doing so well again this season. Chelsea's non-participation in the biggest club competition in the world has benefited us this season in the Premier League but, next season if we qualify to take our place in the draw next season for the group stage, people will have their doubts despite the impact Antonio Conte has made at Chelsea. I sincerely hope that if he does become available that Chelsea make their move because a midfield pairing of Verratti next to Kante would be fantastic for us as we look to build on this season and kick on.